During his Thursday visit to southwestern province Khuzestan, Iran’s President Hassan Rouhani visited the AMAK plan, the largest environmental project of the country in oil and gas sector. 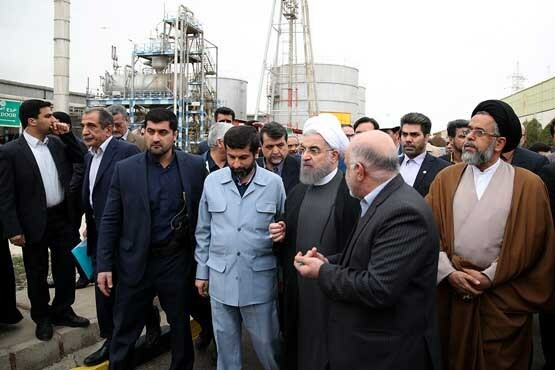 During the Thursday visit, Rouhani was briefed by the engineers and managers of the plan, which is part of the country’s no flaring policies and one of the most important projects to prevent environmental pollution. The plan will also contribute to preventing burning of 241m cubic feet of sour gas per day in an area including Ahvaz, Ramhormoz and Shadegan in southwestern Iran, President’s official website reported. The first phase of AMAK project, named after the initials of the related oil fields, was launched 10 years ago in order to prevent flaring associated gases in the region. The associate gases of the Bangestan layer contain nearly 2.5 percent of sulphide hydrogen, whose flaring releases harmful substances in the air and causes environmental pollution, Shana reported. AMAK as the first mechanized no-flare project is being implemented by domestic experts in the area covered by the National Iranian South Oil Company (NISOC), according to its production manager Ramin Hatami. The country’s largest environmental project in oil and gas sector gathers associated gases in Bangestan layer and a number of oil fields including Abtimour, Mansouri, Maroun, Ahvaz and Kopal.